New Delhi is known for historic sites, parks, shopping, museums, and fun & games. 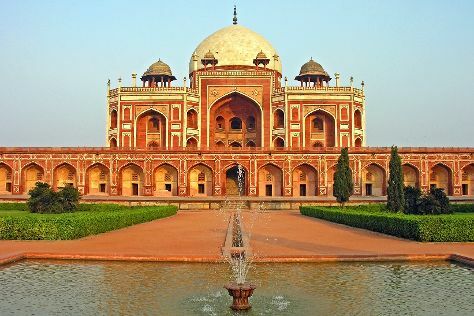 Your plan includes some of its best attractions: take in nature's colorful creations at Humayun's Tomb, steep yourself in history at Raj Ghat, admire the striking features of Rashtrapati Bhavan, and make a trip to India Gate. San Francisco, USA to New Delhi is an approximately 19-hour flight. The time zone difference when traveling from San Francisco to New Delhi is 13 hours. Traveling from San Francisco in December, you will find days in New Delhi are somewhat warmer (73°F), and nights are about the same (48°F). Wrap up your sightseeing on the 26th (Tue) early enough to travel to Jodhpur. 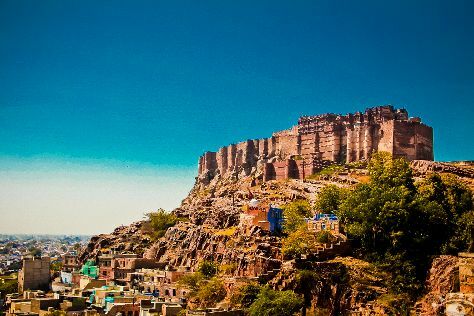 Kick off your visit on the 27th (Wed): examine the collection at Umaid Bhawan Palace Museum, then steep yourself in history at Mehrangarh Fort, and then look for gifts at Via Jodhpur. Take the guesswork out of planning a Jodhpur vacation by using our trip itinerary maker. Traveling by flight from New Delhi to Jodhpur takes 3 hours. Alternatively, you can drive; or take a train. Wrap up your sightseeing on the 27th (Wed) to allow time to travel to Mumbai (Bombay). Kick off your visit on the 28th (Thu): take a memorable drive along Marine Drive, then look for gifts at Bungalow Eight, then don't miss a visit to Gateway of India, and finally stop by SS Homme. Get ready for a full day of sightseeing on the 29th (Fri): snap pictures at Bandra-Worli Sea Link, take in the spiritual surroundings of Shree Siddhivinayak, then let your taste buds guide you at a local gastronomic tour, and finally admire the striking features of Chhatrapati Shivaji Terminus. Traveling by flight from Jodhpur to Mumbai (Bombay) takes 2 hours. Alternatively, you can drive; or take a train. Expect a daytime high around 90°F in December, and nighttime lows around 66°F. Finish your sightseeing early on the 30th (Sat) so you can travel to Udaipur. Kick off your visit on the 30th (Sat): contemplate the waterfront views at Lake Pichola and then take an in-depth tour of City Palace of Udaipur. Traveling by flight from Mumbai (Bombay) to Udaipur takes 2 hours. Alternatively, you can drive; or take a train. Finish your sightseeing early on the 30th (Sat) so you can travel to Jaipur. Spend the 2nd (Tue) wandering through the wild on a nature and wildlife tour. There's lots more to do: explore the historical opulence of Amber Fort, admire the striking features of Sheesh Mahal (Hall of Mirrors), look and learn at Jantar Mantar - Jaipur, and look for gifts at Royal Spices And Tea. Getting from Udaipur to Jaipur by flight takes about 1.5 hours. Other options: drive; or take a train. In December in Jaipur, expect temperatures between 78°F during the day and 50°F at night. Finish up your sightseeing early on the 3rd (Wed) so you can go by car to Agra. On the 3rd (Wed), look for gifts at The Warehouse of Gifts & Souvenirs and then admire the striking features of Taj Mahal. Traveling by car from Jaipur to Agra takes 3.5 hours. Alternatively, you can take a train; or do a combination of flight and train. When traveling from Jaipur in January, plan for a bit cooler days in Agra, with highs around 66°F, while nights are about the same with lows around 45°F. Finish your sightseeing early on the 4th (Thu) so you can travel back home.